Overwatch POP! have sold like widlfire, and continue to do so. Initial orders for the 2nd series of POP! are massive, and this seems to be a license which has an enormous and committed fan-base. 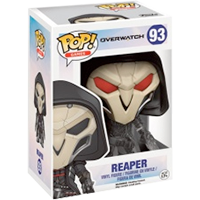 Reaper has been the best-selling figure so far, and this limited edition has him with a bottom half that is semi-translucent - in our words - ‘smokey’. The Smokey Reaper POP! vinyl figure stands around 10cm tall.